The Hill House sits in an area of Winchester that has a hidden and secluded feel yet somewhat paradoxically, has some of the greatest views in the city. Built in the late 70s, the five bed house was recently bought by the current owners from an elderly lady who had not changed the property since its construction. The existing layout was dark, outdated and denied the occupants an appreciation of the stunning views of which the house commands. The client’s approached AR Design Studio with a simple brief; increase the area of the living spaces, allow as much natural light in to the house as possible and maximise the views out. Externally, the now linear nature of the house is highly apparent. At the rear, an elongated insertion frames the new aspect of the house. At the front, one now enters the home via a new double height box which has created a visibly welcoming and clear entrance. Both of these new features are clad in fibre cement, defining the property with a bold and contemporary character. The house, split across three levels, has the bedrooms and bathrooms located on both the lower and upper floors. One arrives on a split level landing and is met with snippets of the stunning views that make the location so special. Descending a few steps down, one arrives at the central floor which plays host to the kitchen, dining and living spaces where the insertion of the contemporary box has allowed for the exterior wall to be completely removed and replaced with a single expanse of sliding glazing; one cannot fail to appreciate the uninterrupted panorama yet feel complete privacy due to the clever orientation of the house. To make the most of the wide plot and provide a new outlook, AR Design Studio proposed the idea of increasing the width of the central floor. In this new space the kitchen, a clean and seemingly simple space, encompasses clever touches which hide the pantry and utility rooms with ‘secret’ kitchen unit doors. As keen hosts, the client’s wanted somewhere for entertaining. The dining space, now large enough to contain a dining table of grand proportions, allows the client’s to enjoy parties. The entire property has been finished with a visibly neutral palette; primarily designed to allow the walls and floors to be decorated by the ever changing play of shadows and dappled light that filters through the trees and dances around the spaces throughout the day. 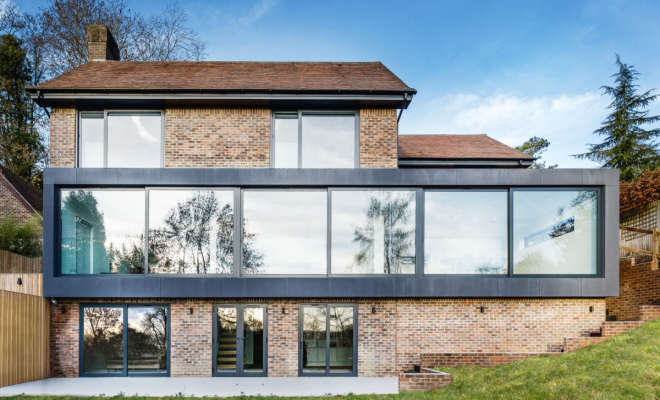 AR Design Studio is a RIBA chartered architects practice, based in Winchester, Hampshire, specialising in elegant and imaginative contemporary new homes, extensions, renovations and mulitplot developments. AR Design Studio’s architectural expertise and flair has been recognised by winning a number of prestigious industry awards including the Royal Institute of British Architects (RIBA) 2012 Regional Award, Civic Trust Award, Daily Telegraph Small House of the Year Award 2014 and were shortlisted for BD House Architect of the Year 2014. With a comprehensive knowledge of planning, AR Design Studio has built a stunning portfolio of completed residential projects. It is a specialist designer of waterfront homes. 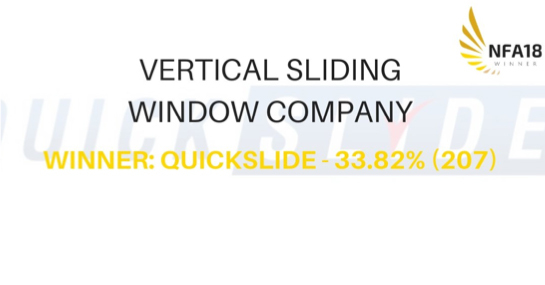 Market-leading window and door manufacturer, Quickslide, is celebrating a win at the 2018 National Fenestration Awards.